There are few professions as life threatening and strenuous as being firefighters. So, why not show respect and give credit where credit is due using challenge coins? Firefighting involves extensive and regularly practiced training evaluations not made for the faint of heart and in themselves offer many occasions for the usage of custom coins. By working closely with other emergency response agencies, firefighters meet their goals of maintaining personal safety, saving lives, saving property and protecting the environment, feats that are often recognized with the presentation of personalized coins. However, firefighter coins do not have to be limited to the skills and requirements of fire prevention, rescue and control. 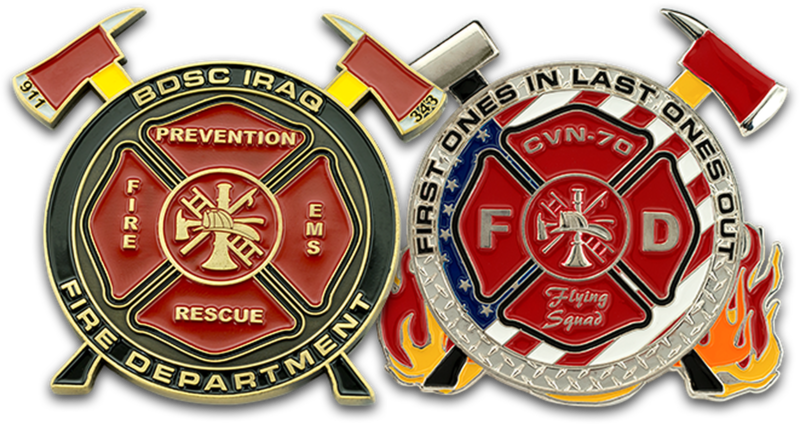 Custom challenge coins for specific causes and fundraisers affiliated with a local fire department have also become increasingly popular. Rather than simply requesting donations, customized coins can be designed to reflect both the fire department and its cause and then be sold to boost fundraising efforts as well as awareness of the cause or organization. Firefighter challenge coins can also be used to say thank you to supporters and show gratitude to volunteer firefighters. With U.S. DOD Coins’ wide assortment of design options and competitive pricing, the possibilities of having one-of-a- kind challenge coins that meet all of your fire department’s needs is endless.